I’m leaving on a two-week trip to Northern Italy tomorrow that will take me from the city of Milan to the coastal and casual Cinque Terre, and then up to Lake Como. While planning my wardrobe, I’ve focused on traveling light while meeting the changing weather conditions that autumn brings. And I’ll be packing it all into one 22-inch carry-on bag that will make both plane and train travel easier. 1. Limit your color palette. Plan everything around a basic neutral color. Choose medium to dark solid colors for your main wardrobe pieces (my personal favorites are black and charcoal grey – they coordinate easily and don’t scream “I’m a tourist!”). Add color with scarves. 2. Choose versatile pieces that can mix and match and let go of the idea of wearing a different outfit each day. Plan to wear each item more than once. For example, a blazer worn on the plane can also be worn casually with jeans or dressed up for dinner. 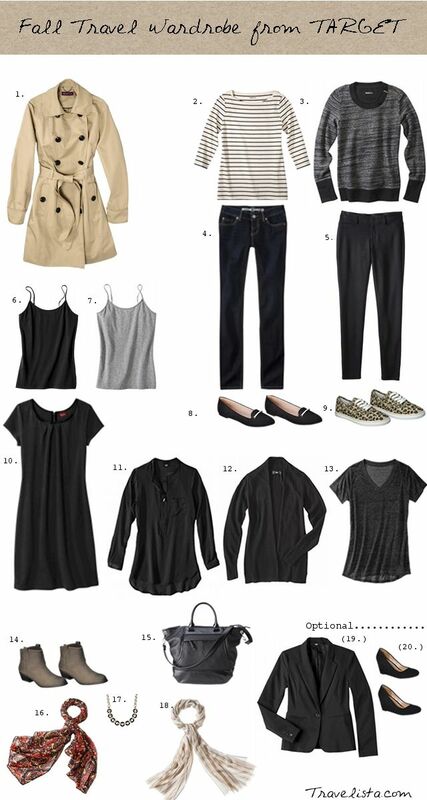 This is the “capsule wardrobe” concept and you’ll find many examples on Pinterest. My own wardrobe is quite similar to this one from Target. Note: Pack clothes that you love, so you feel good wearing the same things many times in different combinations. I’m taking a favorite grey wool doubleknit cardigan jacket, plus two lightweight cardigan sweaters, one beige (cotton), one black (merino wool). Both are ¾ length and can be layered over everything for day or evening. 3. Take more tops than bottoms. Every top should go with every bottom. Several tops will maximize the wear of your bottoms; and they weigh less, take less room, and are easier to launder. Tops, bottoms…How many pieces do you need? Two or three pairs of pants, plus one jacket, plus four to six tops can meet your needs for one week. For two or more weeks, I take one more bottom (pant or skirt) and more tops and launder/clean any items that need it before repeating. For this trip, I’m packing two pairs of pants for day wear and a third pair for evening – you might choose to pack a skirt or dress instead of another pant. Note: I’m also packing hand-washable, drip-dry tops that require no ironing (Heattech T-shirts from Uniqlo and non-iron white shirts from Brooks Brothers are two favorites). Underwear made of comfortable wicking fibers can be washed in your hotel room and will dry overnight. Planning to do hand laundry, I’m only packing three sets of undies and bras (one to wear, one to wash, and one spare). 4. Choose thin items over bulky ones, lightweight fabrics versus heavy. Two thin sweaters (turtleneck + cardigan) are as warm as one bulky sweater but are more versatile and take less space. For the changing fall weather, and going from the city to the coast and back north again, I’m packing items that can be layered (Heattech T-shirt + cardigan sweater + jacket + trench coat when I need the most warmth). 6. Accessorize with lightweight jewelry, belts, and scarves and you’ll achieve several different looks. Unless you’re on a group tour, it’s unlikely you’ll see the same people every day. If you do, they will admire your wardrobe creativity! 7. Exercise shoe control. Take no more than three pair of shoes. Shoes are bulky and heavy. Travel in one pair and pack the others. I’m packing a lace-up sneaker style shoe by ara for daytime city walking (many “on-the-street” photos from Milan’s recent Fashion Week show bright sneakers as a current fashion staple! ), a supportive walking shoe by Naot for the hills of the Cinque Terre, and a dressy flat by Clarks for evenings. All are very comfy and have been broken in before this trip (cute shoes that kill you are a waste of space). 8. Ignore the urge to add in “but what if…” Plan what to pack based on the weather and your activities, packing for what is known as well as logical possibilities. Logical: rain, so I’m taking my new trench coat and umbrella (plus a packable hooded water repellant jacket for the Cinque Terre). Not logical: an impromptu formal evening. If that actually happens, I’ll be in Milan and will have the perfect excuse to shop my heart out! 9. Minimize cosmetics and toiletries by taking only the amount needed for the trip. One ounce of shampoo lasts for two weeks with daily use. Buy sample size cosmetics or transfer the amount needed to a small container. Note: If you are flying with a carry-on bag, be sure to follow TSA’s 3-1-1 rule. 10. Make use of every inch of real estate in the bag. Fill shoes with rolled up socks, belts, jewelry in a soft pouch, or underwear. Roll casual knit clothes and tuck them into the “valleys” created inside the bag by the handle assembly. For tips on how to pack your suitcase be sure to watch my video series. For more comprehensive packing information and how-to’s on customizing your travel wardrobe, order a copy of Smart Packing for Today’s Traveler by Susan Foster. * Travel with a tote that, in addition to your reading materials, electronics, medications, etc. can hold the handbag (preferably a cross-body style) you’ll be using during the day, and inside of that, a wristlit bag (more sensible than a clutch style) for evening. If you are carrying your luggage onto the plane, this will keep you to the rule of only one carry-on bag plus a handbag. * Travel in your heaviest clothes, both to and from your destination, and carry your raincoat. I invite you to share my travel experience and a few “on-the-street” fashion shots from Milan, Genoa, and Lake Como, by following me on Facebook. And, if you need more help in planning your next vacation wardrobe, don’t hesitate to contact me. 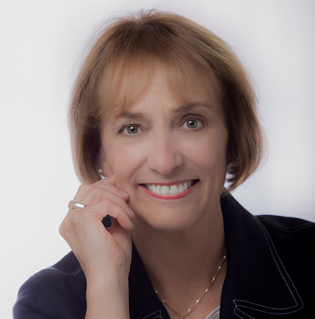 I offer a free 30-minute phone consultation and am skilled at working with my clients virtually! These articles are getting better and better. Well done, Leslie. Have a wonderful trip! Great article Leslie! Have a wonderful trip. 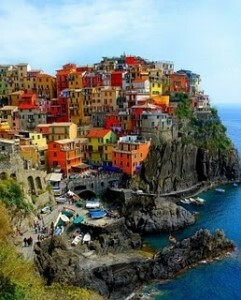 Loved Cinque Terre. As always outstanding advice and safe travels!! Leslie–this is fabulous! I’ve just now read it on Oct 26. Will use it tomorrow in packing for a trip to NZ. 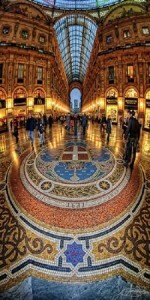 Have a fabulous time in Italy—both locations are beautiful places! !